North Yankton is a American state in the HD Universe appearing in Grand Theft Auto V. North Yankton is on the American/Canadian border and contains the town of Ludendorff. North Yankton is based on the real-life state North Dakota. The state is rural and the climate is primarily cold with the state covered in snow in both its appearances in GTA V. The states police force is the North Yankton State Patrol. It is presumed that Amanda and Michael Townley, Trevor Philips, Bradley Snider and Lester Crest lived within the state prior to the 2004 bank robbery that took place in Ludendorff. The bank robbery, however, is foiled after Michael made an agreement with FIB agent Dave Norton to sell out the Trevor and Brad in order to avoid prison. Their getaway car is wrecked after colliding with a train and they attempt to escape on foot. Agent Norton then shoots Brad and Michael. Trevor briefly attempts to rescue them by killing a number of police officers but is forced to flee. He initially holds a woman hostage and later manages to escape in the mist. Brad dies from his injuries but Michael survives. He and Amanda, with their children Jimmy and Tracey, leave the town after Michael's 'funeral' at the towns main church. In 2013, Trevor finds Michael living in Los Santos and begins working with him once more. Their working relationship, however, sours and Trevor begins thinking about the body buried in Ludendorff in 2004. He later returns and digs up the grave where he finds the decomposed remains of Brad Snider shortly after Michael attempts to convince him not to open the casket. Trevor leaves, returning to San Andreas, while Michael is forced to take on members of the Wei Cheng Triad who eventually manage to kidnap Michael. The Ludendorff page on Lifeinvader is later updated saying that they 'haven't seen anything like this since the bank got robbed 9 years ago'. A misconception is that North Yankton is covered in snow year round, this however is impossible as there are no Canadian/American border states that are winter year round. The only way this would be possible is if the entire state was located in a high altitude mountain range. However large mountains surround Ludendorff confirming the states is likely sea-level. "Yankton" is the name of a real-life town and county in South Dakota, as well as an unincorporated community in Oregon. A North Yankton post card can be found on the official GTA V website. 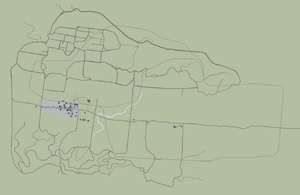 The player can not explore Ludendorff in either of its two appearances as the mission will fail. The player can also not take pictures in the missions. This page was last modified on 16 July 2014, at 23:51.